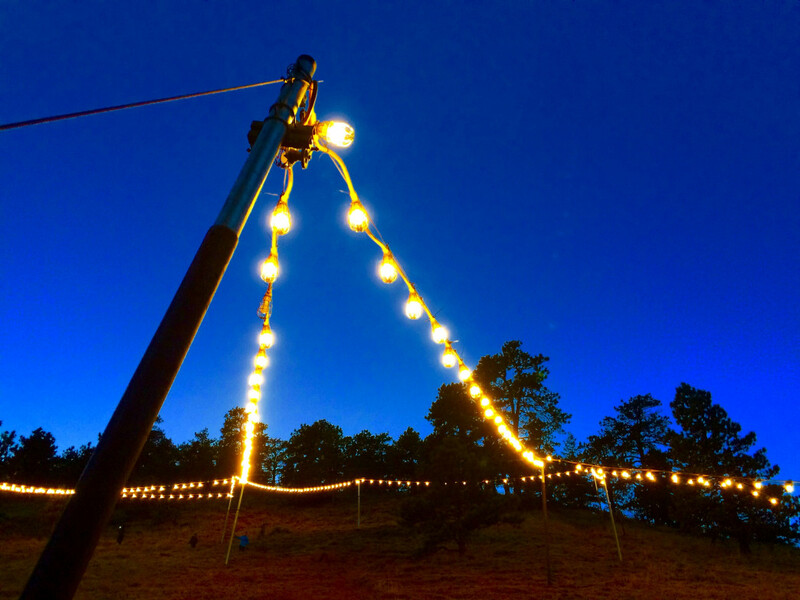 When shortening days start to cast long shadows of darkness on Boulder, Colo., a bright symbol of holiday spirit blinks to life on the flanks of Flagstaff Mountain on the western edge of town. 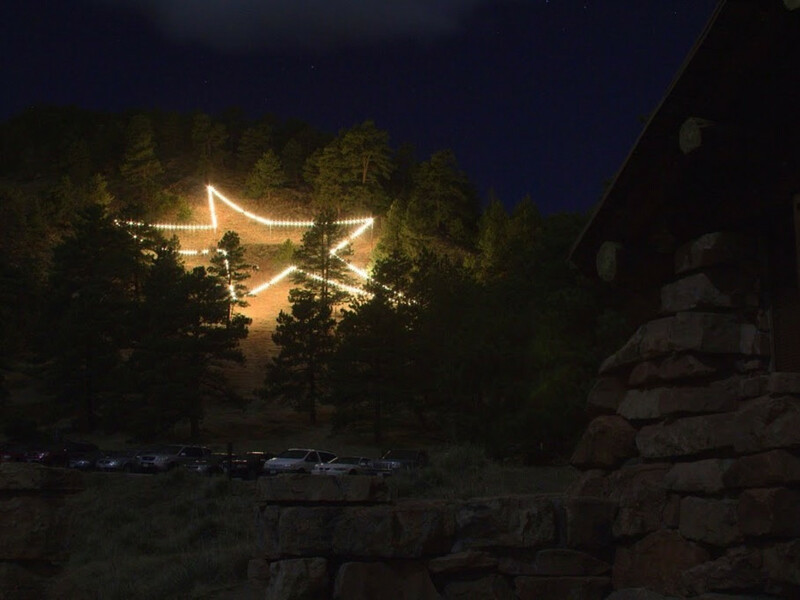 The Boulder Star, formed by a string of nearly 400 light bulbs, shines every night from November 11 until early January. Visible for miles, it attracts starry-eyed locals who come to bask in the glow of the beaming bulbs. The season wouldn’t be complete without a visit to this iconic beacon of light. 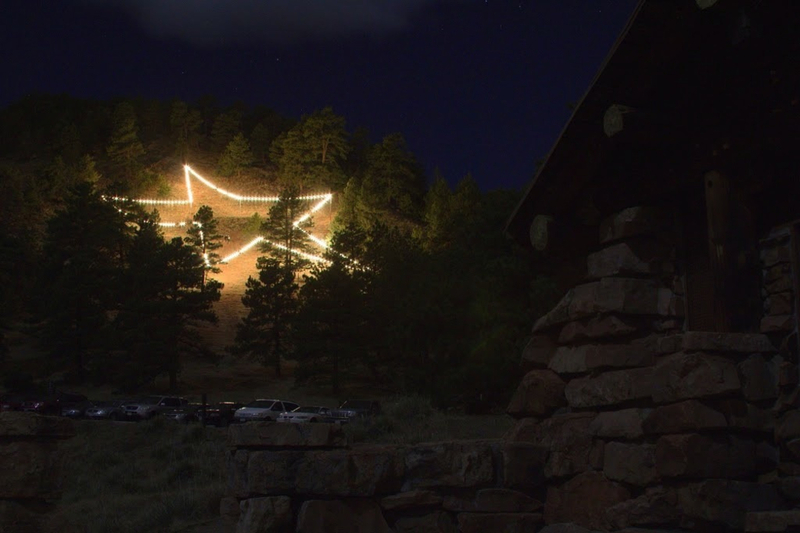 The Boulder Star has been a holiday tradition since 1947, originally alternating each year between a star and a cross, and surviving vilification and vandals. One year, mischief-makers reshaped it into a peace symbol. The Boulder Chamber of Commerce maintains the shining star, with support from Citywide Banks and Lord & Reynolds Electrical Services. Upkeep isn’t cheap, and it's a community effort. To fund repairs, the chamber sells an annual Boulder Star Card, featuring artwork by a local artist and produced by Leanin' Tree. In addition, Boulder's Bookcliff Vineyards produces a Boulder Star Wine to benefit the star. The star is, indeed, a labor of love for Craig Reynolds, an electrician who donates his time to maintain it, including a complete overhaul in 1998, and replacing all of the lights with energy-efficient LED bulbs last year. “When I started, I had no idea it would be going so long,” he said. “Here it is 15 years later. I can’t believe the time has gone that fast.” The star holds such a special place in Reynolds’ heart that he proposed to his wife smack dab in the middle of it. To see the star up close and personal, you can easily drive up Flagstaff Road a short distance. But why not turn the pilgrimage into an adventure? Bundle up, pack a headlamp and thermos of hot toddies, and make the journey on foot. It’s about a mile hike up. Make sure to bust out Yaktrax if it’s snowy. Allow about 45 minutes at a leisurely pace so you can linger along the way. 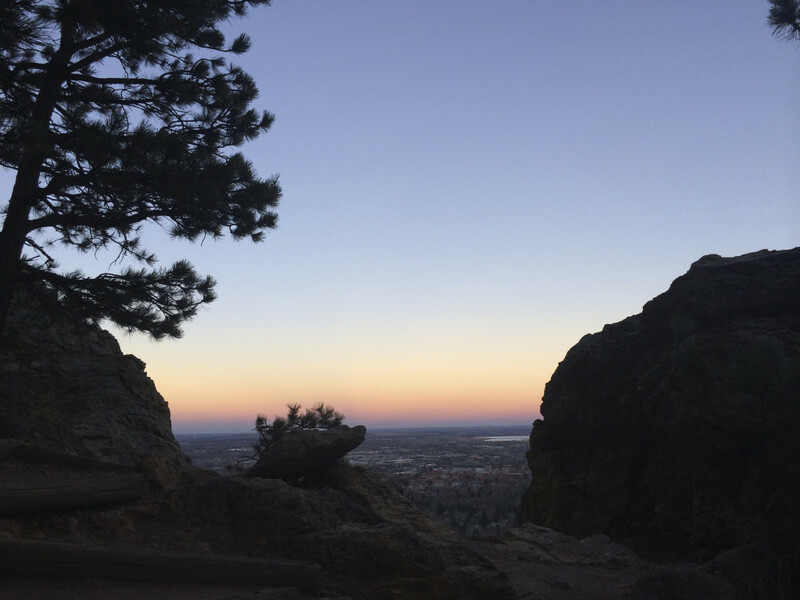 As you climb in the fading daylight, marvel at the expansive views of Boulder as the sky turns to soft hues of orange and blue. A peaceful calm drapes over the city as the day draws to a close. For maximum wow factor, shoot to get to the star just before it lights up at 4:30pm, then relax for a while with a celebratory sip. For extra credit, check the lunar calendar and time your trip with a full moon rising. 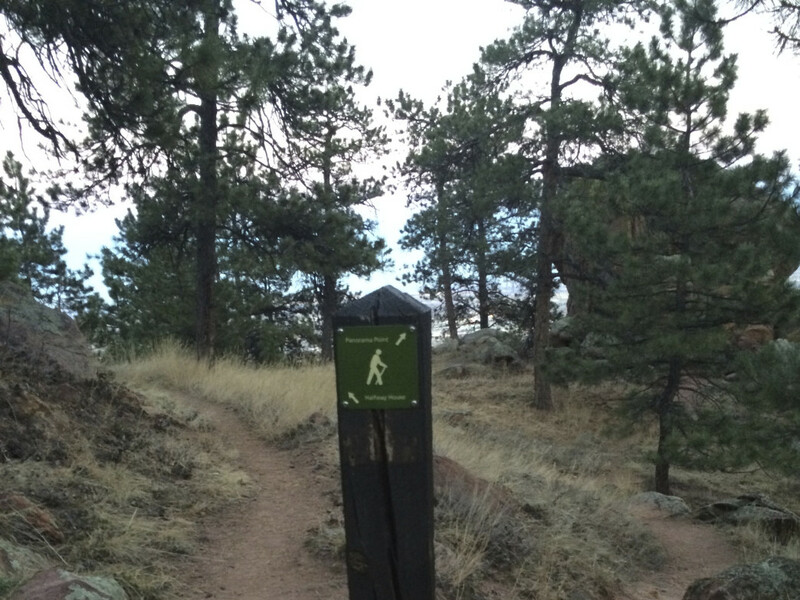 Start out on the Flagstaff Trail, which begins off Baseline Road right at the junction of Gregory Canyon Road. 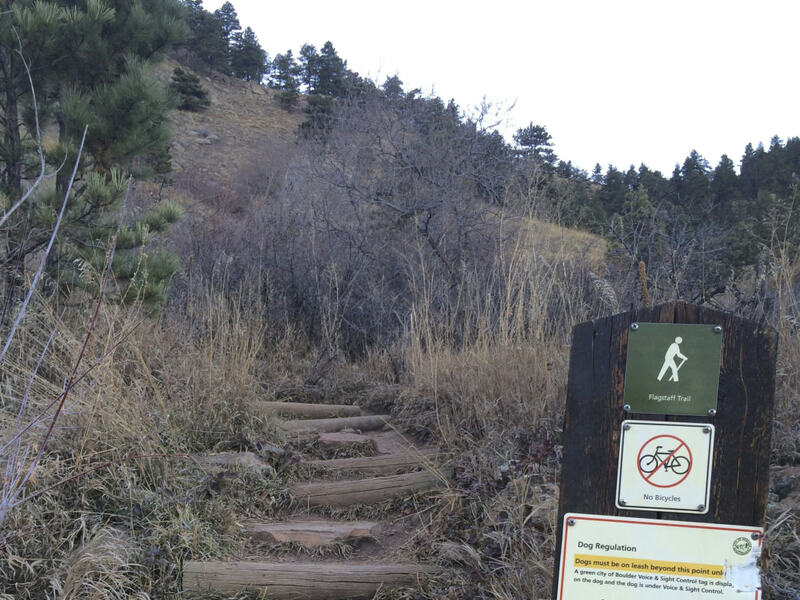 The Gregory Canyon Trailhead is closed due to flood damage—likely until mid-2015—but you can park along Baseline Road, or in Chautauqua Park if you’re willing to hoof it through the Chautauqua meadow to access the trail. 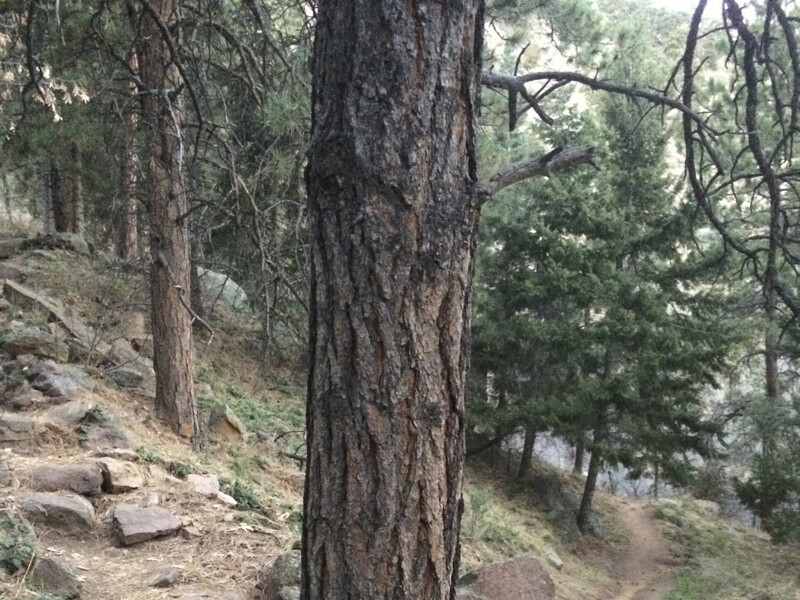 As you head up the Flagstaff Trail, pay attention to the forks in the trail—they will be trickier to navigate on the way down in the dark. After climbing through craggy rocks tinted with colorful lichens, turn right at the marked trail junction to head toward Panorama Point and the Halfway House. Bear right at the next fork, which is marked only by a giant ponderosa pine tree. At the next junction, bear left toward the Halfway House. When you reach the stone house, look across Flagstaff Road and you’ll see the star’s string of bulbs waiting to ignite—if you’ve timed it right. Too late and you’ll be greeted with festive rays of light. 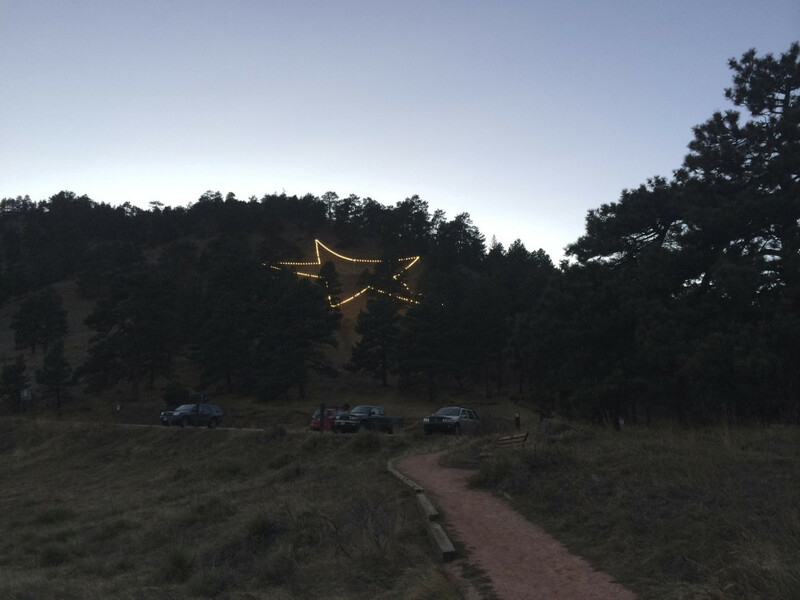 Joe Reale, ranger supervisor for Boulder Open Space and Mountain Parks , says it’s best to admire the lights from below since there’s no trail to the star, and the slope is steep and slippery. Settle in, sip something warm, and share some holiday cheer. The descent is magical under the cover of night. Turn on your headlamp, and remember which trails you took on the way up. Bear right at the first fork, keeping the star just above you. Then take a left at the fork by the big tree. The rest of the way should be easy, with signs to guide you.